“From Touched to Exalted” from Christian Faith Publishing author Nancy Jones is a poignant opus that contains truthful circumstances that reflect a profound healing from the toils of life. “From Touched to Exalted”: powerful account of the author’s once sorrowful life that resonates of faith and determination. “From Touched to Exalted” is the creation of published author, Nancy Jones, a retired trunk facilities engineer, and a dedicated writer. Jones shares, “Learn about Nancy’s incredible journey from touched to exalted. From her own life experience she has recognized there are countless wounded adults from traumatic childhoods that are spiritually bankrupt and void of any hope for change as she once was. Based upon the many institutions that have eliminated a positive life concept, it’s no wonder there appears to be little or no possibility of healing. "There are those, like Nancy, who believe they carry a responsibility to present and share with skeptics and nonbelievers the idea of a healing personal relationship rather than mere participation in restrictive organized religious genres. People who have tested this relationship may be the only catalyst toward true love, fulfillment, and faith to those living without these life-enhancing concepts. "Nancy’s story begins with unimaginable neglect, physical, and emotional abuse and repeated abandonment. Love, understanding, and trust were painfully absent. Unlike today, there were few sources available to such children who were most often threatened into silence about their trauma. As a result, the effects of their devastation lasts for decades in their hearts and tormented minds. "From attempted suicide as a teenager to decades of counseling, twelve-step programs, metaphysical energy healing, bodywork, acupuncture, and reading of innumerable self-help books, Nancy succeeded in recognizing the numerous issues that contributed to her need for something more. Published by Christian Faith Publishing, Nancy Jones’s new book treasures powerful perspectives that will surely inspire every reader with wisdom and insight on God’s goodness for the distressed and broken. View a synopsis of “From Touched to Exalted” on YouTube. Consumers can purchase “From Touched to Exalted” at traditional brick & mortar bookstores, or online at Amazon.com, Apple iTunes store, or Barnes and Noble. 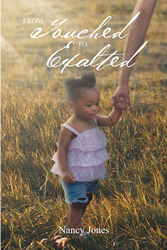 For additional information or inquiries about “From Touched to Exalted”, contact the Christian Faith Publishing media department at 866-554-0919.